Calling all David Bowie fans - we present the Ziggy Stardust Doll! Calling all David Bowie fans – we present the Ziggy Stardust Doll! He’s sure to become a treasured gift for David Bowie and Ziggy Stardust fans – and of course the children of such fans – we give you the 1970s rock music icon Ziggy Stardust in all his rather cute hand painted and handcrafted glory. 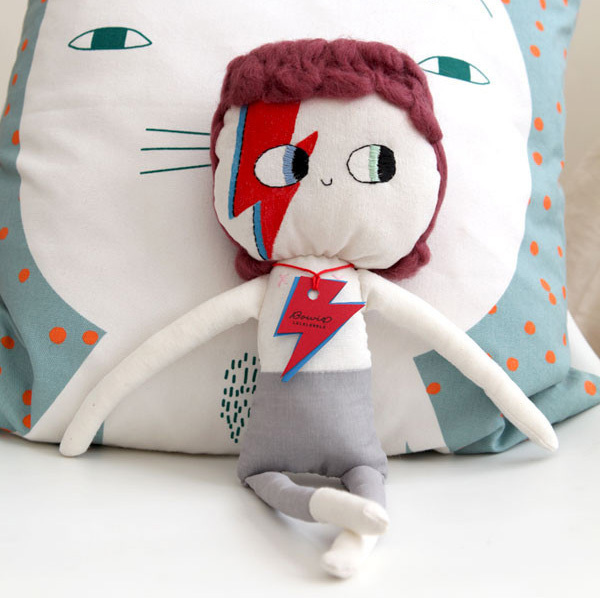 From Spain’s Lelelerele, the Ziggy Stardust Doll stands at 38cm and is made from super soft cotton and mohair. His beautiful big eyes are firmly embroidered – note the differing colour – a misconception caused by David’s anisocoria (thanks Google) and his face is expertly painted by hand. A shock of ravishing red hair completes the look perfectly. He said it himself, It Aint Easy being Ziggy Stardust – in true diva style, this rock star is best showcased on a shelf – he’s more for show, being admired for his glitz and glamour rather than being rough handled by small people. Though he’s best not played with, what a fun throwback and nod to great music of the past to have in your child’s space! The Ziggy Stardust Doll is priced $119.95 and is available locally from The Gathered Store.